MSI has recently unleashed two new FM2+ motherboards for their GAMING series, the MSI A88X-G45 GAMING and A88XM GAMING. Like the other MSI GAMING series motherboards, these two new FM2+ boards features Killer LAN, Audio Boost Sound enhancement technology and many more. 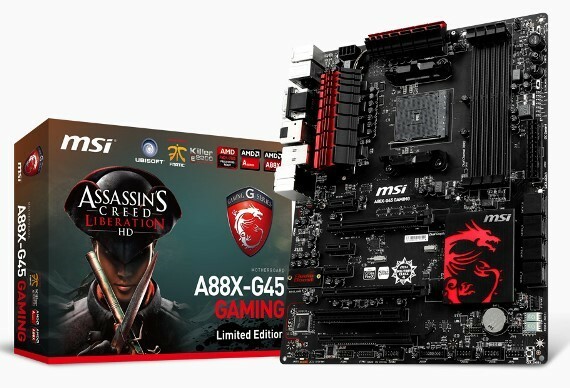 MSI has also decided to bundle the A88X-G45 with the game Assassin’s Creed Liberation for free. Both these new GAMING motherboards also features Military Class 4 high quality and stability standards, OC Genie 4 – 1 second OC, 4K UHD support, 3 display outputs, PCI Express Gen 3, AMD CrossFire support and Fast Boot. Check out the rest of their features and specifications below. Reward your ears with true quality. Get ready for ear-drum shattering sound, with MSI Audio Boost! With Audio Boost we’re delivering the highest audio quality with the use of Creative Sound Blaster Cinema so you can enjoy crystal clear sound and music through 8-channel HD Audio. Because the complete audio circuitry is isolated from other features through EMI shielding, you’ll enjoy less interference and more stability resulting in a sensational sound quality. Topping this with the use of gold plated connectors, illuminated isolation line, studio level integrated headphone amplifier and high quality audio capacitors, and whether you demand the best sound quality for music or professional gaming, MSI Audio Boost delivers. When connecting USB devices such as External DACs, only MSI Real USB Power can continue to deliver 5V to the USB ports on motherboards. Not just one USB port, MSI USB Audio Power exclusively supports all USB ports. The USB audio power design, which powers the USB port independently, offers more stable power and audio signals. The whole new design results in much clearer sound effects with reduced noise along with stable voltage for improved stability for the users’ extra devices, enjoying an enriched sound presentation. Make use of advantages while gaming online with MSI to get ahead. Killer LAN automatically detects and accelerates game traffic ahead of other network traffic for smoother, stutter-free in-game performance and the competitive edge. With this exclusive, automatic traffic prioritization, games and real-time chat get priority over low-level system chatter, giving you the lowest latency for game data on the most controllable network hardware available. Military Class 4 is the next step in high quality components. The Hi-c Cap, Super Ferrite Choke and Solid CAPs will make sure that your PC runs more stable under extreme conditions. These key components have all passed the seven tests of MIL-STND-810G military class which are performed by independent laboratories to ensure stable operation under the harshest environments. MSI GAMING motherboards are equipped with many exclusive new technologies, including the all new two-stage one-second overclocking OC Genie 4, the world’s first graphical monitoring interface Click BIOS 4, and the Control Center software that combines monitoring, tuning and remote controlling, and much more. The easy to use high quality software and hardware design allow consumers to gain more convenient experiences. As of to date, the MSI A88X-G45 GAMING and A88XM GAMING respective manufacturer’s suggested retail price are not yet disclosed. However it is expected that we will see both of these two new FM2+ motherboards soon, perhaps starting this February.